2 Backup Phone Chargers For Only $10 Shipped! You are here: Home / Great Deals / 2 Backup Phone Chargers For Only $10 Shipped! If you’ve ever been out and stranded without a charge on your phone you know how handy these are! 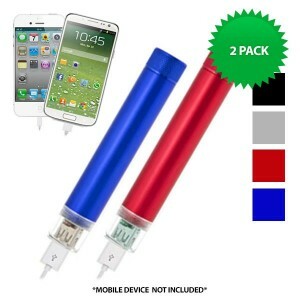 Grab 2 Backup Phone Chargers For Only $10 Shipped at Maxwell’s Attic! Sign up for Maxwell’s Attic and confirm your email to receive a $5 off $10 purchase. Add this 2 Backup Phone Charger pack for $15 to your cart. Grab this deal for only $10 Shipped! FREE Shipping on all orders at Maxwell’s Attic!